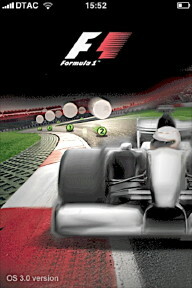 Bangkok Diary Monday 24 August 2009: Formula 1 Timing App - 2009 Championship Pass: is $16.99 really OK? I have been following Grand Prix racing since my childhood in the UK. I can remember watching when the engines were in the front and we had teams like Maserati, Cooper-Climax and Vanwall. When I was working in the UK I lived not far from Silverstone, so that was a frequent destination, where I once chatted to a gentlemanly Stirling Moss. For several summers I wandered across Europe, one year watching Clay Regazzoni muscle his BRM round the curves on the back of the Nurburgring and getting invited into the UOP motorhome while Peter Revson was in there: the year Stewart won with Cevert behind. Then later on to Monza for three or four years, rushing across the circuit with the Tifosi at the end of each race. I have yet to see a Grand Prix in Asia and these days make do with the TV broadcasts. Having recently made a trip back to the UK, I was able to make some comparisons with the way the BBC presents races and now find Star somewhat lacking, The difference is the information available. Back in the 70s, one of my pleasures was reading the race reports from Denis Jenkinson in Motor Sport, himself co-pilot with Moss in the Mille Miglia. His writing on that magnificent race, perhaps long out of print, is a masterpiece of the Art. What made that report and his writing on Grand Prix races so interesting was his mastery of data. Although Steve Slater and his co-commentators do a pretty good job, there are times when the true afficionado craves more knowledge. Occasionally, a flash of the displays available to the teams will be shown; or some extra facts will be given in the commentary. On my short trip back to the UK, I was able to view some of this missing data on the TV and know that I am missing out. One of the former members of the Honda team has been involved in the development of a Formula One Timing app [iTunes link] for the iPhone that allows F1 fans to follow the practices and race with amazing details, linked in part to the sensors in the tracks and the transponders that send back data. My thanks to Jeff Pappone of The Globe and Mail for the heads-up on this app and for the Mac Daily News link. I was just about to press the button to download this when I saw the price of $16.99 which was way above my normal budget. There is a lite version for $1.99 that gives data for the Friday practice, but that may not cut it for some. I am afraid that in the end I weakened and bought the full app. For much of the weekend -- a race weekend -- while trying it out, I was wondering if I had wasted my money. 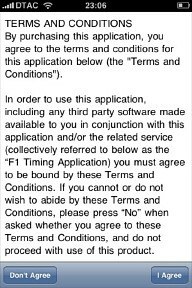 The app which can run on either the iPhone or the iPod touch, starts with the unusual step of posting a set of Terms and Conditions . One has to agree before being allowed to use the app. It is a bit of a waste if one disagrees: press that button and the app would just be so much dead code. Among the conditions are a provision that allows the developer to change the conditions at any time, but the responsibility is the users to be up to date. I find this distasteful. There is no clear information, either in the conditions or the iTunes page that the high charge for the app is a one-off or applies only to the current season and future seasons will also incur charges. There is only reference to the 2009 season. A further charge (or charges) would not surprise me as the data comes from Formula One Administration Limited - Bernie Ecclestone's firm that controls most of F1 - and this is not a charitable organisation, having understood far earlier than many (and far better than news media) about control and distribution of data. The app has four main sections: Race, Information, News and Settings. The Race tab has two ways to display information -- live and downloaded. As this is the core of the app and perhaps justification for the higher price, I will deal with this last. Information is broken into six subsections including a Help panel at the top, which is broken into four sections to match the tabs visible at the bottom of the screen: race, info, news and Setup. This is followed by Drivers, Teams, Races, Standings and Credits: this last details organisations that provide data as well as those responsible for the app, Soft Pauer and all their pals. Drivers are listed in team order and only those racing, which I find odd. So, while Luca Badoer was included, neither Massa nor Piquet were, although both are mentioned almost in passing in the teams section. Each driver entry begins with a section of statistics which is followed by a racing biography. Lewis Hamilton's place of birth was wrongly spelled Stevanage (it is Stevenage). There is almost no personal information included apart from place of birth and nationality. The Teams section is similarly constructed with a section of statistics and a bare racing history, which in the case of Ferrari goes back to 1951 (I don't actually remember that), but does not mention the origin of the prancing horse, granted to Enzo Ferarri when he engineered spectacular victories for the pre-WW2 Alfa-Romeo team. In a rare foray into the personal, Frank Williams major road accident in 1986 is included. It is with the Races section that things start to pick up. All the races for the season are listed and each is in three sections: race, which gives basic information concerning the race and times (these can be converted to local times); Circuit which has more data concerning the specific venue, plus a clear circuit plan which can be enlarged; and the results section. 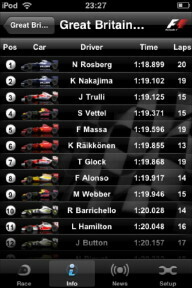 Results contains statistics for the two days of practice, plus qualifying and the race. The timed sections display position, a clear icon of the car, plus driver's name, time and number of laps completed. This only works in portrait mode. The race results are in a similar format, although of course the data is different. For races not run, this section is blank, although for the European GP in Valencia, when I accessed this section a few hours after the race I found it was complete. 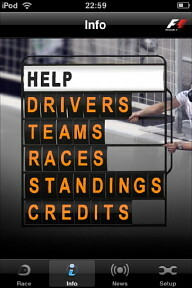 Standings is in two parts: driver and constructor, with each displaying position, name, a car icon, and points scored. Again, when checking only a couple of hours after the race -- I had to eat -- this was up to date and included points from the day's event. The News section is in two parts: latest news and Live feed. The latter is not always available, of course, but even when running, the information is also available, like ticker-tape, in the race section and this would not necessarily be missed. The Latest News section struck me as being somewhat sparse, although tapping an entry loaded a web page at the Formula One website with much more information. However, when one did use this, the app was closed and had to be restarted. The Setup section reveals a type of search engine that allows users to select a race from the season, and then a session (practice, qualifying, race. 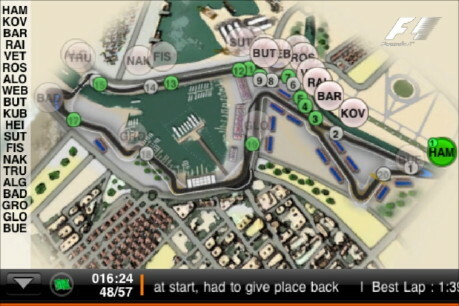 The first section gives users the venue, and this is not limited to the current race. I was able, for example to enter the previous race (Hungary) and then that is downloaded and I was able to rerun it on my iPhone in the "Race" section (below). The second panel gives the user the particular session (practice, race). Both of these use the selector wheel for making choices. The next panel, for times, also uses the selector wheel with "Now" and "Actual" buttons at the top. The wheel allows selection of times: current, past and future. I did not, for example, try selecting the Hungarian GP with a time in the future: perhaps these should be greyed out. Three other on/off selections are available for Fade Cars, Show Tips (infuriating as these may be with their frequent appearance, it may be better to leave them on in early use as there is so much to discover), and Hide Stopped Cars. This section, first of the tabs that is visible, is the raison d'être of this app. There are two displays: a circuit map and a timing screen. The device will show the running of a session either live (for the current race) or using downloaded data from a pre-run race. When the display is in portrait mode, a small circuit map is displayed in the lower half of the screen and scrollable driver data, five cars at a time, is at the top. When landscape mode is used, the map is shown full screen: pressing an arrow (bottom left) will switch to the driver data, displaying 15 cars. When the race or practice is taking place, the displays are updated constantly. Data comes from the transponders on the cars which react with the electronic loops in each track situated at about 200 metre intervals. I was concerned initially about the way data would be made available and this was mainly worry about its delivery. Where I am, halfway round the world, I would expect delays, but in addition, my own experience over several years with the reliability of data and its free flow, gave me some pause when I made the purchase (and set about using it) as to just how accurate such delivery would be. Read on. . . . Depending on settings, a user will be following one of the practice sessions, qualifying or the race. For most fans, the race itself is paramount. Like a selection of a previously run race (see above) when the race had been completed, the next time I started the app, the race was downloaded to the device and started to run automatically. By tapping the time icon at the bottom of the screen, a slider bar replaced the ticker-tape newsfeed and the event could be advanced or reversed. When it was time for the race, I must admit that I cheated: in the interests of research for this review, I cheated. As the app installed on both the iPhone and the iPod touch (Generation 1), I used them both. On the iPhone I ran the circuit diagram with the cars circulating. 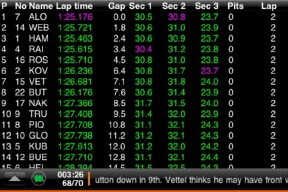 The iPod touch was set up to display race statistics: positions, lap times, split times. In retrospect, with the television as my prime source of input, this was too much. I found that, despite the aesthetic nature of that map with its cool cars moving round, I was using the iPod touch with its timing display far more. For the next race (Belgium), I will use one of the two devices and switch between the two display modes when needed. I need not have been concerned about the displays updating as this was every bit as dynamic as I had hoped. Indeed, on one or two occasions, I was fed significant data that I noted with interest (in all honesty I was on the edge of my seat), just before the TV commentators announced it. And I had much more data, right down the field. On one or two occasions I did experience a slight delay in the way the data updated. Each of these was linked to pit stops and the timing at the circuit may have been the origin of any such confusion. When one more lap had taken place, the displays caught up. When I did look at the map display it was merely to confirm what the timing screens and the TV were already telling me. I found that with all cars on the circuit, particularly in the opening laps, the closeness of the driver icons, made clear identification and understanding of the picture a little difficult. That was in contrast with the clarity of the timing data. I would prefer the option of the display I have seen on MotoGP race transmissions, which allow one or two competitors to be shown only. The map can be enlarged with the double tap and the pinch and it can also be rotated as well as tilted to give a 3D appearance. 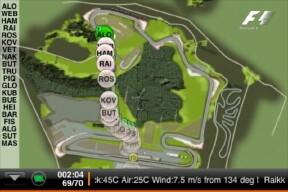 If a specific driver is chosen, the image enlarges to the section of track he is on and follows the progress closely in something resembling a helicopter shot. The icon of the driver being followed changes to yellow (the leader's is green). as the map is tilted and moves around to follow the driver, so it ceases to become centred and an amount of effort is needed to bring the display back to a sensible size and position. A button to re-centre might be a useful addition. When the app is running these displays, the screen sleep function is disabled so the device is drawing on the battery constantly. As long as there is a full charge at the start of a race, there will be no problem and I found that about 40% of the battery power had been used while I was viewing the events at Valencia. This is not particularly surprising and should be compared, say, to running a 2-hour video which would also use a fair amount of power. While I had initial doubts about the effectiveness of this app, for the most part these evaporated with the start of the race: the app is its own best proof. There is still some balance of information that, for me, may need to be addressed, particularly in the quantity/quality of news available as well as the amount of relatively static data on drivers, teams and circuits. I also question the omission of certain drivers, particularly Massa who, should he return this season (although I think this doubtful), may affect the Championship; or Piquet. Both of these drivers are included in Drivers' Championship Standings. The clincher for me will be the price of any update: the references to the 2009 season suggest that there is a probability for a subscription payment scheme to be applied, but I can find no information about this on the iTunes store pages or on the developer's own site. With the 3.0 update to the iPhone and iPod touch firmware, this was one of the features introduced and while Apple focussed in presentations on add-ons for games, this could as easily be applied to subscription services. My own view is that something in the region of $5 - 10 would be acceptable. The $16.99 price already jumps a number of psychological barriers on fees; and to have to buy the entire app for a follow-up year would not be acceptable: at least, certainly not for me. I would be disappointed. This is a pricey but useful app for those interested in detail about Formula 1 while the race (or practice) is taking place. We see that the developer is thinking about other racing formulae. I want this for MotoGP.